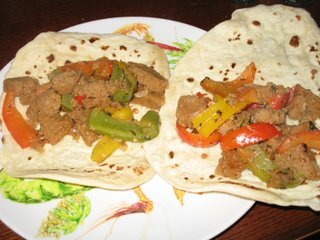 Tonight I made fajitas with some homemade seitan. This is one of our family favorites. It was originally based on the "beef fajitas" from the Joy of Cooking. Mix together the lime juice, cilantro, onion, garlic, red pepper flakes, & coriander in a medium-sized bowl. Add the peppers & seitans & mix well. Allow to sit for 10-15 minutes. In a skillet, heat 1 T of oil over medium high heat. Add the seitan, peppers, & sauce to the skillet, and saute for about 10 min. Meanwhile, heat your tortillas in the oven, at 100 degrees of so... just enough to make them warm and soft. Next, add the water to the the seitan-peppers, give it a quick stir, and cover for 1-2 minutes. Now it's ready! Yum yum yum. This recipe is so fantastic! 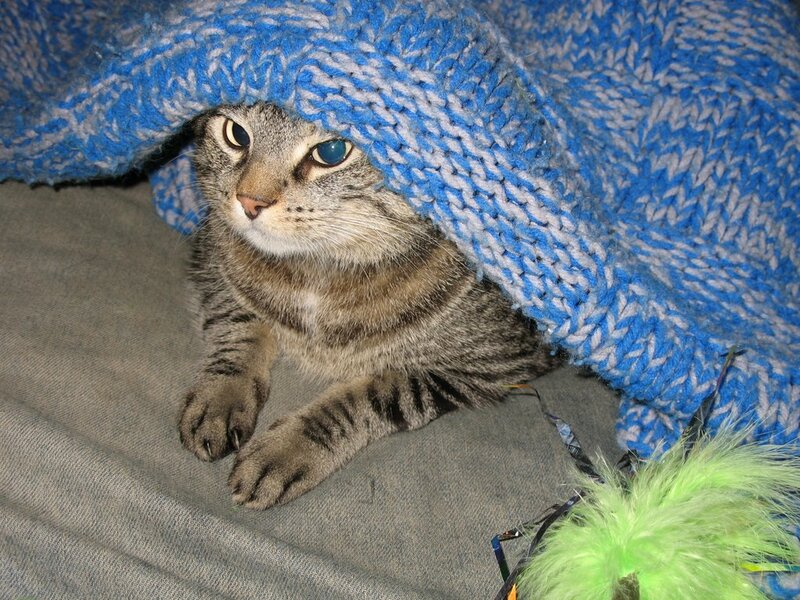 Also, I am unable to resist sharing this cute picture of my cat Yummers. Yummers is such a cool and special cat. As I am typing, he is curled up next to me... when I take a bath at night, he comes and sits next to the tub, and - coolest of all - every morning when I do my yoga practice, he comes into the studio with me. He's a very special friend. 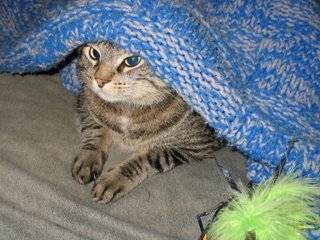 :) This picture is him hiding under the blanket after a crazy-play session with his green toy. Bijou wants to thank Yummers for his best wishes. Meow! Any cat that likes yoga is a keeper! He sounds like a good friend. And so cute. Don't worry... the bright peppers and tomatoes won't last forever here either... Soon enough I'll be all butternut squash and root veggies like the rest of you. We've lucked out with a sunny fall so far, but it started raining yesterday - so I'm not sure what I'll find at the farmer's market tomorrow. Yummers is SO sweet! That's a great photo! I also really like Seitan in recipes like this. I am still learning how to use seitan... but I really like it. Yeah, Yummers is awesome! We are about to go out to the studio and do our yoga for the day!